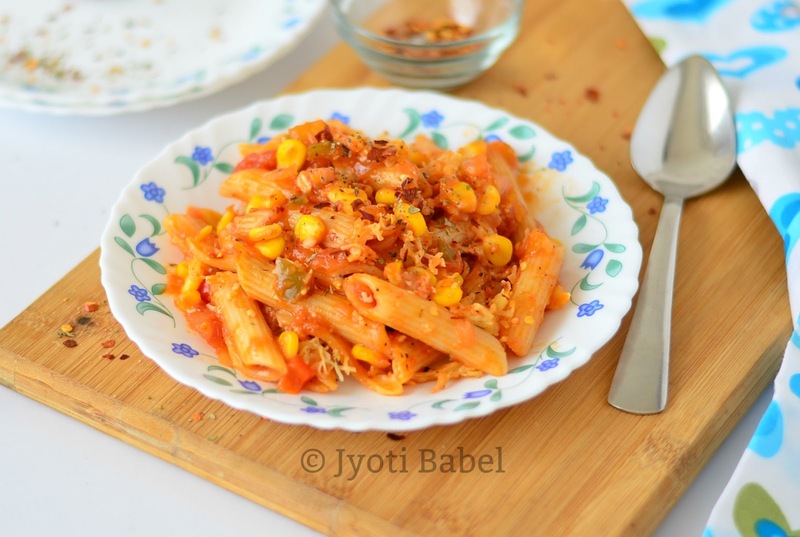 Penne Pasta in Red Sauce with veggies is a regular dish in my household. On days when I am not in the mood to cook an elaborate Indian meal with roti, subji, dal and chawal, it comes to my rescue. They not only make for a filling meal but can be made relatively faster. The recipe I am sharing today is that of penne pasta in the red sauce along with some veggies. 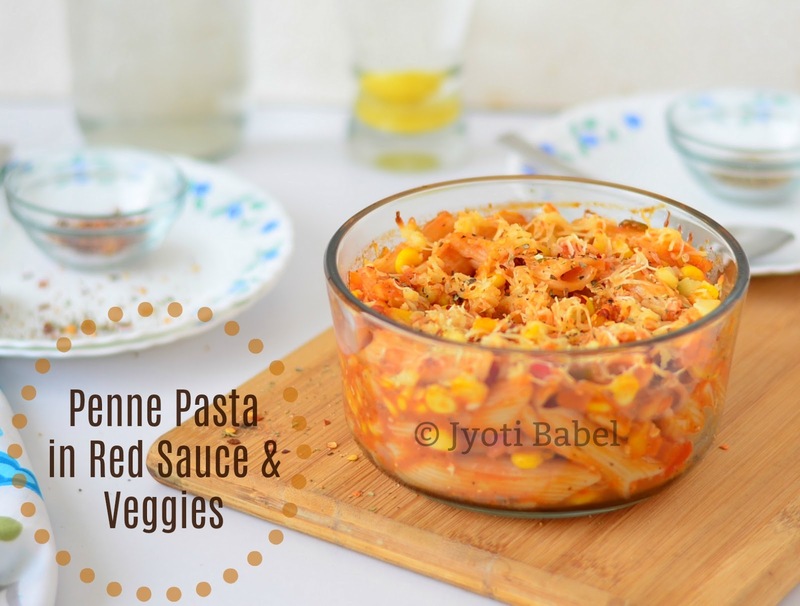 I have added just capsicum and sweetcorn, but if you are not pressed for time, you can add many more veggies - anything that catches your fancy. I always prefer to bake my pasta for the final cooking. First I boil the pasta in water till they are just done. When the sauce is ready and I toss in the pasta, cook on stove top for a couple of minutes and then transfer it all in a casserole, top it with cheese and bake it for 15-20 minutes. I think this way flavour of the sauce seeps into the pasta making it taste great. I am sharing this recipe under Summer Casserole Dishes Theme of Week#2 of BM#79. 1. Heat oil in a pan. Add the butter, followed by chopped onion and garlic and sauté on a medium flame for 2 minutes. 2. Add the chopped capsicum and cook it covered on a medium flame for 2 to 3 minutes. Add the fresh tomato puree and salt and cook it for 5-7 minutes. Stir in between. 4. When it looks a bit cooked, add tomato ketchup, oregano, chilli flakes and sugar. Stir well and cook on a medium flame for about 7 to 10 minute. The red sauce should be nice and thick by now. 5. 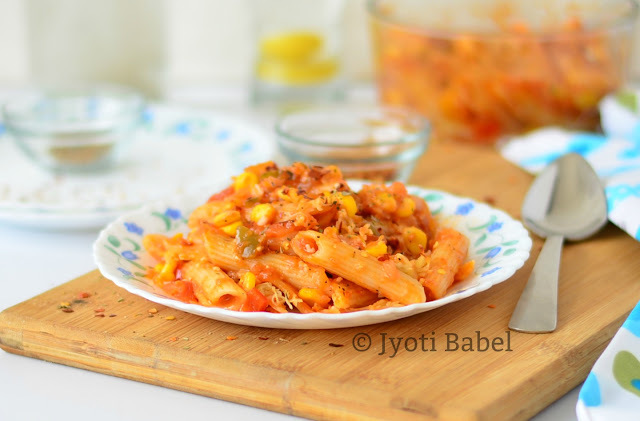 Add the cooked pasta, boiled sweet corn and gently toss everything and cook on a medium flame for 2 more minutes. The pasta should be well coated with the sauce. 6. Transfer the pasta in a casserole that has been pre-greased with butter. Top it with grated cheese and bake it in a preheated oven at 180 C for 15-20 minutes. Serve hot. Enjoy! 1. You can add any other veggies of choice like broccoli, mushrooms, baby corn, etc. Looking for a dessert ides to go with this meal, check out my molten lava chocolate cake.